Turns out, Monday was too! 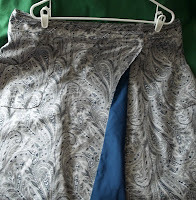 First—a lovely lavender linen skirt that had been taken apart got put back together—6 or so inches narrower –but still pretty loose and comfy. With short sleeves, too. Since day one, the long sleeves had been too long—now they are just right! 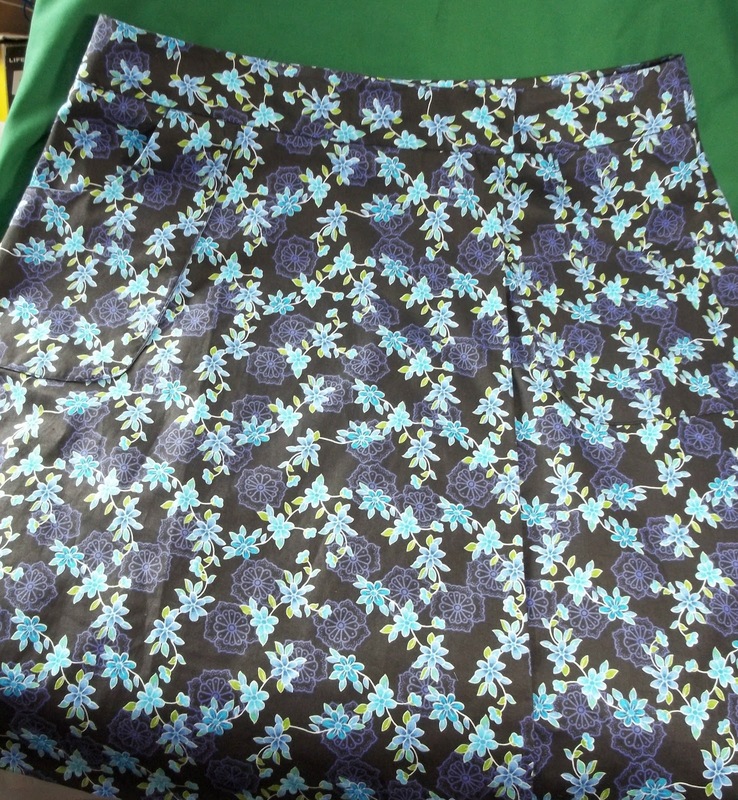 The finished skirt wasn't perfect—I cut the pattern size based on my hips—but my waist is not as small proportionally as the pattern suggests—so its a bit snug (for now)--but it doesn't matter as much in a wrap around skirt. The plan is to be able to move the buttons and make the skirt 'smaller' with out much real altering—so for now its a bit bigger (and doesn't over lap as much as the pattern plans for) but hopefully as the summer progresses, that will change. (and, no the grey skirt doesn't actually have buttons--I didn't have any handy, so I used some hooks and eyes that I did have. Version 2—Done today—is a black background calico—with a light blue lining panel. The pattern doesn't call for the lining—but I like the idea—I think it makes the skirt look- Oh, so much more finished—and there is enough of the poly cotton left over (both the navy and the light blue) to make a matching camp shirts —which will end up being quite a nice looking outfit—though yesterday, I wore the grey paisley with a grey t shirt. But I could have worn a navy one—or even a dark blue twill shirt from a few years ago (or for that matter a black or white twill shirt)--I have enough stuff that goes with grey (included easily, half a dozen pairs of socks!) The same goes for the black calico—there are several shade of blue, green and purple in the print—and I have T's (and socks!) in most of these colors. The pattern is a McCalls one—Labeled “1 Hour”--which is a total lie. I am pretty efficient—and this skirt took me 4 hour to make (and I still haven't made the buttonholes, or sewn on the buttons). My changes (the front panel lining) didn't really add much time (folding, pressing and making a rolled edge would have required 1 seam, the lining required 2—but both were fast and easy straight seams (and rolling an edge is a bit slow going) The binding on the waist band took some time—but a lot less than neat, hand sewing the waist band would have!--the other major change I made was to make the waist band simple (and not to include the self tie) I think the tie might be nice on a very soft and drapy fabric, but my cotton was a bit heavy—and I thought the tie would be too bulky. The cost—about $25—but this includes the still uncut left over poly cotton for a matching camp shirt. The camp shirts will be perfect matches for skirts (well-- perfect matches to inside lining) —but useful on their own too. A navy blue camp shirt will look great with a white or natural linen skirt (and I have!) 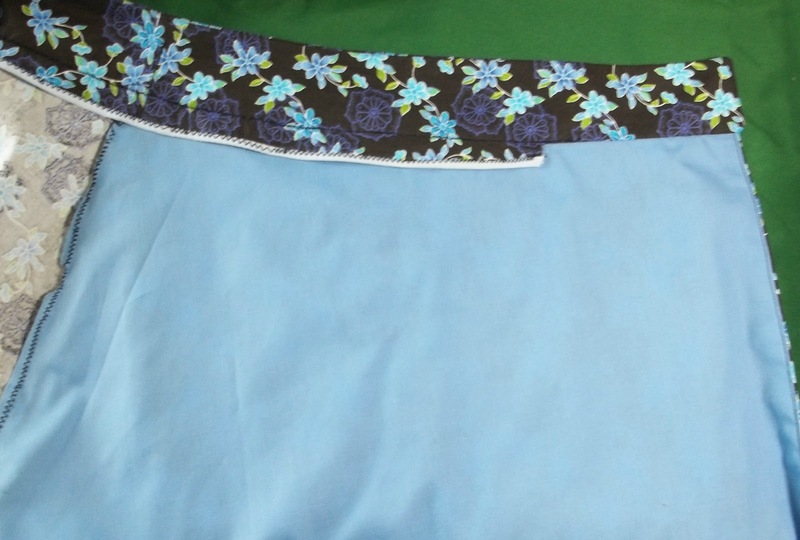 the light blue will look great with the black linen skirt--(last week's sewing project!). And both with look good with denim skirts. I suspect, if I spend 4 hours looking—just locally, where I have a choice of Kohl's, Century 21, Burlington Coat's, Marshall's Old Navy and a Sears—I could have found something I liked and that met my exacting requirements (POCKETS! I will not buy casual clothes without pockets) for about the same amount of money (for the skirt alone). 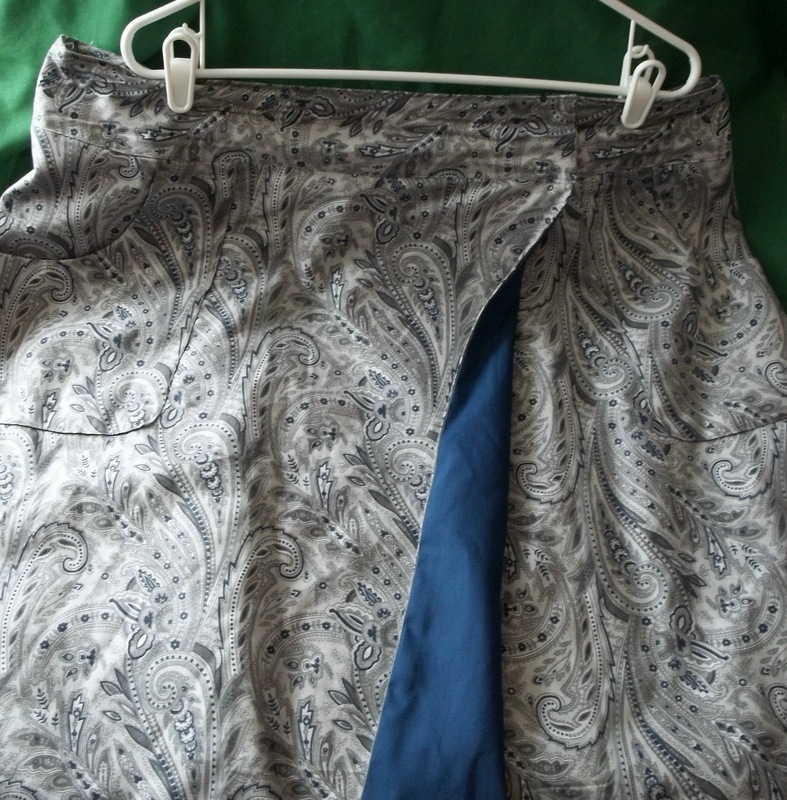 But I know any $25 skirt I might have found, wouldn't be as nicely made or finished. And certainly, I wouldn't get a skirt and shirt for $25-- OK the buttons for shirt will add another few dollars—but not much—and the $25 includes interfacing and thread. Well I had thread—but I used up all of my black spool—so I need a new spool. 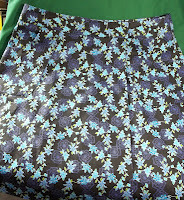 I am not including the cost of the pattern—partly because it gets, in effect, cheaper every time I make another skirt! I think I am going to keep up sewing for a day or two—I like how I look in better fitting clothes, and goodness know, I have a ton of fabric available to me to sew--(I am thinking of the 4 cuts of fabric I planned to sew last year and never got to, and some others that I got when IKEA had its $2 a yard sale a few weeks ago. And there are linen dresses to take in, and---camp shirts to make --to match the skirts. Secret socks are 5 inches tall—but they are going to be boot tall (or about 12 inches, not my usual 9 inches) so there is still plenty to. I haven't done a single round of the shawl—but now that I have finished sewing for the day—maybe I'll get a round or two done.